Congressional Republicans, who have had their differences with President Donald Trump, rallied behind the commander-in-chief Monday night after his speech outlining what he called a new plan for the 16-year-old U.S. war in Afghanistan. Trump spoke in a forceful tone but offered few specifics in the 30-minute nationally televised address, vowing to base military decisions in Afghanistan on "conditions on the ground, not arbitrary timetables" — a point that earned plaudits from GOP leaders. House Speaker Paul Ryan, R-Wis., said he was "pleased" with Trump’s plan and called it "a new Trump strategy, doctrine — principled realism." 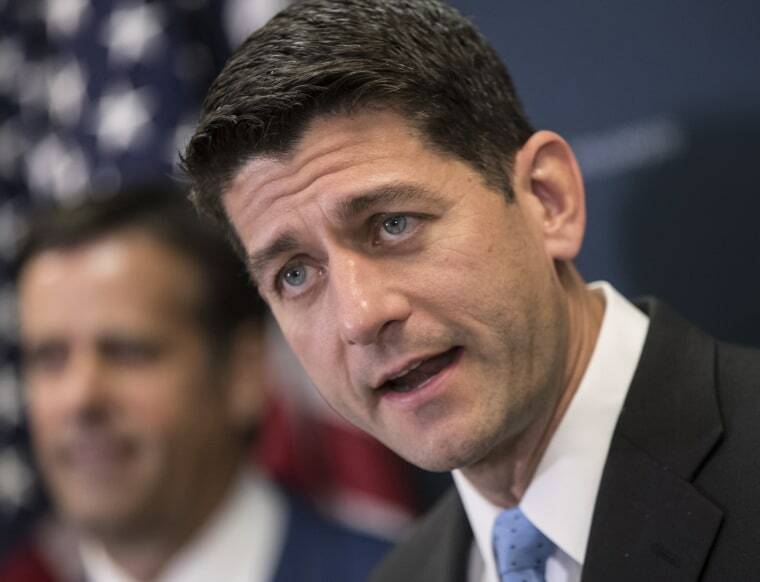 "I think it’s important when it comes to our safety that we have a comprehensive doctrine, and I think he spent the last six months working on that," Ryan said at a town hall meeting in Racine, Wis., which was broadcast on CNN. "The last 16 years, our comprehensive Afghanistan strategy was 16 one-year strategies." Sen. John McCain, R-Ariz., who released his own Afghanistan strategy earlier this month after he grew frustrated with the White House’s lack of action, said the president’s speech was a "big step in the right direction." Trump "is now moving us well beyond the prior administration’s failed strategy of merely postponing defeat," McCain said. Senate Majority Leader Mitch McConnell, R-Ky., who Trump has repeatedly attacked in recent weeks for failing to advance health care legislation, applauded the president's speech, saying it "reaffirmed to the American people the painful lesson glaringly brought to our shores on September 11, 2001." "I commend the president and his national security team for a thoughtful review of our engagement in the region," he said. Sen. Marco Rubio, R-Fla., meanwhile, tweeted that Trump’s "New #AfghanStrategy based on the conditions on ground not on arbitrary numbers and timelines is the right approach." "Good #AfghanStrategy & excellent speech by @POTUS laying it out to the nation," he added. Other Republicans, however, criticized Trump. Sen. Rand Paul, R-Ky., a tea party darling who has long advocated for a reduced role in military conflicts abroad, said Monday ahead of Trump’s speech that "the mission in Afghanistan has lost its purpose" and called it a "terrible idea" to send any more troops to the country, although Trump did not explicitly say that's what he intended to do. Breitbart News — where Steve Bannon returned as executive chairman after exiting as Trump’s chief White House strategist — led its site with three glaringly critical headlines of the speech, including one that dubbed Trump's speech a "Flip-Flop." Reporters and editors at the site also took to Twitter to bash the president’s speech and compared his strategy to that of former President Barack Obama. "Obama 2009: ‘The days of providing a blank check are over.’ Trump 2017: ‘Our support is not a blank check,'" tweeted Breitbart’s White House correspondent Charlie Spiering in a post. House Minority Leader Nancy Pelosi, D-Calif., took aim at Trump for contradicting the position he'd taken on Afghanistan during the campaign and demanded that "the American people need to know more" about the new strategy.